As Alaska State Trooper Robert Sable investigates the strange disappearance of six scientists from Fort Greely, he discovers a secret Army project. Scientists have gathered under the leadership of a ruthless general, Charles Dean, to create the ultimate soldier. During a catastrophe, an experimental virus escapes from the project. Thinking the virus is deadly, Dean tracks a scientist exposed to the virus to a local Tlingit village. To contain the virus and protect his secrets, Dean decides to destroy the village and all its inhabitants. Sable must find a way to save the Indians and bring the general to justice. Most Alaskans have heard rumors of powerful ancient shamans. 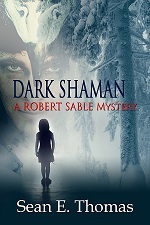 Dark Shaman turns that legend into a fast-paced murder mystery in which Alaska State Trooper Sergeant Robert Sable, along with help from the FBI, investigates the ritualistic deaths of school children. Rumors hint to an absurd idea that the children were slaughtered by Auktelchnīk, a powerful evil shaman who somehow has been resurrected. As more bodies turn up, Sable and his partners try to find the connections between the victims and their killer by interrogating local rapists, pedophiles and sexual deviants. Someone begins killing off the suspects one by one. Is this a new killer, an irate parent or someone else? Along the way, Sable encounters a bevy of nasty characters who could only be found in Alaska.